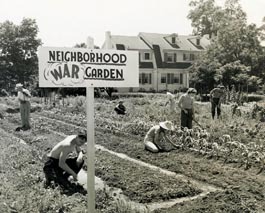 Victory Gardens were common; this is a file photo, not from Amery. German soldiers arriving on the Soo Line Railroad, getting off at the Amery Depot and taking over the city. What was that? 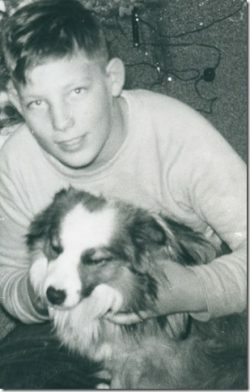 It was the nightmare of a young teen living in Amery during World War 2. Barbara Burman, now Barbara Preble living in Prospect Heights, Illinois, sent two pages of typed notes to me, filled with WW II Amery memories. And what readings those pages were, sharing feelings, sights, and key Amery locations from 75 years earlier. She’s the daughter of the late John Burman. On the day of the Pearl Harbor attack, Barbara and her family had been dining with relatives in St. Paul. After the initial news, she remembers parking within sight of the Mississippi River and listening to further reports on their car radio. Throughout the war, posters that inspired and warned were seen all over Amery. “Loose Lips Sink Ships”, “I Want You” from Uncle Sam, and “Remember Pearl Harbor”. “Buy War Bonds” was also a common appeal. Visible reminders to her of the war effort were victory gardens, coupons for food and goods, and foil collection for the government. An aunt with a certain type of hair had it cut, to be donated it to the government to make parachutes. Barbara’s aunt and uncle ran Conrad’s Grocery Store, and she helped her Aunt Stella count and organize coupons. Red coupons allowed people to buy meat and sugar, blue ones let them purchase canned good. The two of them would count the coupons turned in at the store, and Aunt Stella or Uncle Con sent them to the county office. A candy bar, a rarity, was Barbara’s reward on special days. Every family had a friend or relative who was serving in the military. Farm men were exempt from the draft, the government recognizing them as essential to raise crops for the war effort. Barbara often wrote to her uncles in the service, and answering letters came back to her with parts blacked out for security reasons. People regularly listened to radio reports from the war in Europe and the Pacific. Her uncles in the Pacific wrote about Kamikaze planes that would fly directly at the ships, and other suicide pilots did this as well. For a time around 1943 only bad news came out, with thousands of soldiers killed as well as and ships and planes destroyed. Barbara the teen thinks back, remembering this as a depressing time. With that in her mind, she dreamed that awful nightmare of Germans taking over Amery. 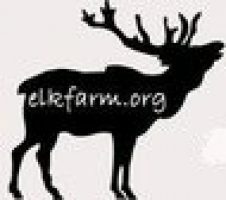 Thanks for writing, the guy at our local phone company put this blog together, and he made it so easy to post and edit and add photos/ pictures. I think what I like is the simplicity of this one, but I can always improve. Good luck, keep me informed about what you do to start a blog. Very interesting, Loren. I love to read about the past from a local perspective. And Sue, just so I don’t lead you astray, the word fictional and hypothetical comes up every so often. This is a fictional setting and mansion, but I’m going to make it as real as a storyteller can make it. Lots of story possibilities with the wealthy family, a mental asylum, a hospital, and an orphanage. Have you ever been to Superior to the Fairlawn Mansion? It’s on the highway as you’re headed toward Duluth, but it faces the lake in Superior. Huge family mansion that became a state orphanage in the 30s to the 60s I think. What wonderful tours they give. Alpha, thanks for taking the time to write a comment.